23 A None No Power Seat 23 A has extra legroom. The tray table is in the armrest, making the armrest immovable and slightly reducing seat width. There is no floor storage during takeoff and landing. 23 B None No Power Seat 23 B has extra legroom. The tray table is in the armrest, making the armrest immovable and slightly reducing seat width. There is no floor storage during takeoff and landing. 23 D None No Power Seat 23 D has extra legroom. The tray table is in the armrest, making the armrest immovable and slightly reducing seat width. There is no floor storage during takeoff and landing. 23 E None No Power Seat 23 E has extra legroom. The tray table is in the armrest, making the armrest immovable and slightly reducing seat width. There is no floor storage during takeoff and landing. 23 F None No Power Seat 23 F has extra legroom. The tray table is in the armrest, making the armrest immovable and slightly reducing seat width. There is no floor storage during takeoff and landing. 23 G None No Power Seat 23 G has extra legroom. The tray table is in the armrest, making the armrest immovable and slightly reducing seat width. There is no floor storage during takeoff and landing. 23 J None No Power Seat 23 J has extra legroom. The tray table is in the armrest, making the armrest immovable and slightly reducing seat width. There is no floor storage during takeoff and landing. 23 K None No Power Seat 23 K has extra legroom. The tray table is in the armrest, making the armrest immovable and slightly reducing seat width. There is no floor storage during takeoff and landing. 24 G None No Power Seat 24 G may have restricted legroom due to the presence of the entertainment box under the seat. 25 A None No Power Seat 25 A is an Economy Class seat that may have restricted legroom due to the presence of an entertainment box under the seat in front. 25 D None No Power Seat 25 D is an Economy Class seat that may have restricted legroom and under seat storage due to the presence of an entertainment equipment box. 25 G None No Power Seat 25 G is an Economy Class seat that may have restricted legroom and under seat storage due to the presence of an entertainment equipment box. 25 K None No Power Seat 25 K is a standard Economy Class seat. This seat may have restricted legroom due to the possible presence of an entertainment box under the seat in front. 26 A None No Power Seat 26 A is a standard Economy Class seat. This seat may have restricted legroom due to the possible presence of an entertainment box under the seat in front. 26 D None No Power Seat 26 D is an Economy Class seat that may have restricted legroom and under seat storage due to the presence of an entertainment equipment box. 26 G None No Power Seat 26 G is an Economy Class seat that may have restricted legroom and under seat storage due to the presence of an entertainment equipment box. 26 K None No Power Seat 26 K is a standard Economy Class seat. This seat may have restricted legroom due to the possible presence of an entertainment box under the seat in front. 27 A None No Power Seat 27 A is an Economy Class seat that has limited recline. The proximity to the lavatory may be bothersome. This seat may have restricted legroom due to the possible presence of an entertainment box under the seat in front. 27 B None No Power Seat 27 B is an Economy Class seat that has limited recline. The close proximity to the lavatories behind may be bothersome. 27 D None No Power Seat 27 D is an Economy Class seat that has limited recline. The close proximity to the lavatories behind may be bothersome. 27 E None No Power Seat 27 E is an Economy Class seat that has limited recline. The close proximity to the lavatories behind may be bothersome. 27 F None No Power Seat 27 F is an Economy Class seat that has limited recline. The close proximity to the lavatories behind may be bothersome. 27 G None No Power Seat 27 G is an Economy Class seat that has limited recline. The close proximity to the lavatories behind may be bothersome. 27 J None No Power Seat 27 J is an Economy Class seat that has limited recline. The close proximity to the lavatories behind may be bothersome. 27 K None No Power Seat 27 K is an Economy Class seat that has limited recline. The proximity to the lavatory may be bothersome. This seat may have restricted legroom due to the possible presence of an entertainment box under the seat in front. 29 D None No Power Seat 29 D has extra legroom due to its positioning in the exit row. The proximity to the lavatory can be bothersome. The tray table is in the armrest, making the armrest immovable and slightly reducing seat width. There is no floor storage during takeoff and landing. 29 E None No Power Seat 29 E has extra legroom due to its positioning in the exit row. The proximity to the lavatory can be bothersome. The tray table is in the armrest, making the armrest immovable and slightly reducing seat width. There is no floor storage during takeoff and landing. 29 F None No Power Seat 29 F has extra legroom due to its positioning in the exit row. The proximity to the lavatory can be bothersome. The tray table is in the armrest, making the armrest immovable and slightly reducing seat width. There is no floor storage during takeoff and landing. 29 G None No Power Seat 29 G has extra legroom due to its positioning in the exit row. The proximity to the lavatory can be bothersome. The tray table is in the armrest, making the armrest immovable and slightly reducing seat width. There is no floor storage during takeoff and landing. 30 A None No Power Seat 30 A has extra legroom due to its positioning in the exit row. The proximity to the lavatory can be bothersome. The tray table is in the armrest, making the armrest immovable and slightly reducing seat width. There is no floor storage during takeoff and landing. 30 B None No Power Seat 30 B has extra legroom due to its positioning in the exit row. The proximity to the lavatory can be bothersome. The tray table is in the armrest, making the armrest immovable and slightly reducing seat width. There is no floor storage during takeoff and landing. 30 D None No Power Seat 30 D is an Economy Class seat that may have restricted legroom and under seat storage due to the presence of an entertainment equipment box. 30 G None No Power Seat 30 G is an Economy Class seat that may have restricted legroom and under seat storage due to the presence of an entertainment equipment box. 30 J None No Power Seat 30 J has extra legroom due to its positioning in the exit row. The proximity to the lavatory can be bothersome. The tray table is in the armrest, making the armrest immovable and slightly reducing seat width. There is no floor storage during takeoff and landing. 30 K None No Power Seat 30 K has extra legroom due to its positioning in the exit row. The proximity to the lavatory can be bothersome. The tray table is in the armrest, making the armrest immovable and slightly reducing seat width. There is no floor storage during takeoff and landing. 31 A None No Power Seat 31 A is a standard Economy Class seat. This seat may have restricted legroom due to the possible presence of an entertainment box under the seat in front. 31 D None No Power Seat 31 D is an Economy Class seat that may have restricted legroom and under seat storage due to the presence of an entertainment equipment box. 31 G None No Power Seat 31 G is an Economy Class seat that may have restricted legroom and under seat storage due to the presence of an entertainment equipment box. 31 K None No Power Seat 31 K is an Economy Class seat that may have restricted legroom and under seat storage due to the presence of an entertainment equipment box. 32 D None No Power Seat 32 D is an Economy Class seat that may have restricted legroom and under seat storage due to the presence of an entertainment equipment box. 32 G None No Power Seat 32 G is an Economy Class seat that may have restricted legroom and under seat storage due to the presence of an entertainment equipment box. 32 K None No Power Seat 32 K is an Economy Class seat that may have restricted legroom and under seat storage due to the presence of an entertainment equipment box. 33 A None No Power Seat 33 A is an Economy Class seat that may have restricted legroom due to the presence of an entertainment equipment box. 33 D None No Power Seat 33 D is an Economy Class seat that may have restricted legroom and under seat storage due to the presence of an entertainment equipment box. 33 G None No Power Seat 33 G is an Economy Class seat that may have restricted legroom and under seat storage due to the presence of an entertainment equipment box. 33 K None No Power Seat 33 K is an Economy Class seat that may have restricted legroom and under seat storage due to the presence of an entertainment equipment box. 34 A None No Power Seat 34 A is an Economy Class seat that may have restricted legroom due to the presence of an entertainment equipment box. 34 D None No Power Seat 34 D is an Economy Class seat that may have restricted legroom and under seat storage due to the presence of an entertainment equipment box. 34 G None No Power Seat 34 G is an Economy Class seat that may have restricted legroom and under seat storage due to the presence of an entertainment equipment box. 34 K None No Power Seat 34 K is an Economy Class seat that may have restricted legroom and under seat storage due to the presence of an entertainment equipment box. 35 A None No Power Seat 35 A is an Economy Class seat that may have restricted legroom due to the presence of an entertainment equipment box. 35 D None No Power Seat 35 D is an Economy Class seat that may have restricted legroom and under seat storage due to the presence of an entertainment equipment box. 35 G None No Power Seat 35 G is an Economy Class seat that may have restricted legroom and under seat storage due to the presence of an entertainment equipment box. 35 K None No Power Seat 35 K is an Economy Class seat that may have restricted legroom and under seat storage due to the presence of an entertainment equipment box. 36 D None No Power Seat 36 D is an Economy Class seat that may have restricted legroom and under seat storage due to the presence of an entertainment equipment box. 36 G None No Power Seat 36 G is an Economy Class seat that may have restricted legroom and under seat storage due to the presence of an entertainment equipment box. 36 K None No Power Seat 36 K is an Economy Class seat that may have restricted legroom and under seat storage due to the presence of an entertainment equipment box. 37 A None No Power Seat 37 A is an Economy Class seat that may have restricted legroom due to the presence of an entertainment equipment box. 37 D None No Power Seat 37 D is an Economy Class seat that may have restricted legroom and under seat storage due to the presence of an entertainment equipment box. 37 G None No Power Seat 37 G is an Economy Class seat that may have restricted legroom and under seat storage due to the presence of an entertainment equipment box. 37 K None No Power Seat 37 K is an Economy Class seat that may have restricted legroom and under seat storage due to the presence of an entertainment equipment box. 38 A None No Power Seat 38 A is an Economy Class seat that may have restricted legroom due to the presence of an entertainment equipment box. 38 D None No Power Seat 38 D is an Economy Class seat that may have restricted legroom and under seat storage due to the presence of an entertainment equipment box. 38 G None No Power Seat 38 G is an Economy Class seat that may have restricted legroom and under seat storage due to the presence of an entertainment equipment box. 38 K None No Power Seat 38 K is an Economy Class seat that may have restricted legroom and under seat storage due to the presence of an entertainment equipment box. 39 A None No Power Seat 39 A is an Economy Class seat that may have restricted legroom due to the presence of an entertainment equipment box. 39 D None No Power Seat 39 D is an Economy Class seat that may have restricted legroom and under seat storage due to the presence of an entertainment equipment box. 39 G None No Power Seat 39 G is an Economy Class seat that may have restricted legroom and under seat storage due to the presence of an entertainment equipment box. 39 K None No Power Seat 39 K is an Economy Class seat that may have restricted legroom and under seat storage due to the presence of an entertainment equipment box. 40 A None No Power Seat 40 A is an Economy Class seat that may have restricted legroom due to the presence of an entertainment equipment box. 40 D None No Power Seat 40 D is an Economy Class seat that may have restricted legroom and under seat storage due to the presence of an entertainment equipment box. 40 G None No Power Seat 40 G is an Economy Class seat that may have restricted legroom and under seat storage due to the presence of an entertainment equipment box. 40 K None No Power Seat 40 K is an Economy Class seat that may have restricted legroom and under seat storage due to the presence of an entertainment equipment box. 41 A None No Power Seat 41 A is an Economy Class seat that may have restricted legroom due to the presence of an entertainment equipment box. 41 D None No Power Seat 41 D is a standard Economy Class seat. This seat may often be bumped by service carts or others passing by due to the awkward configuration transition from 4 to 3 seats. 41 G None No Power Seat 41 G is a standard Economy Class seat. This seat may often be bumped by service carts or others passing by due to the awkward configuration transition from 4 to 3 seats. 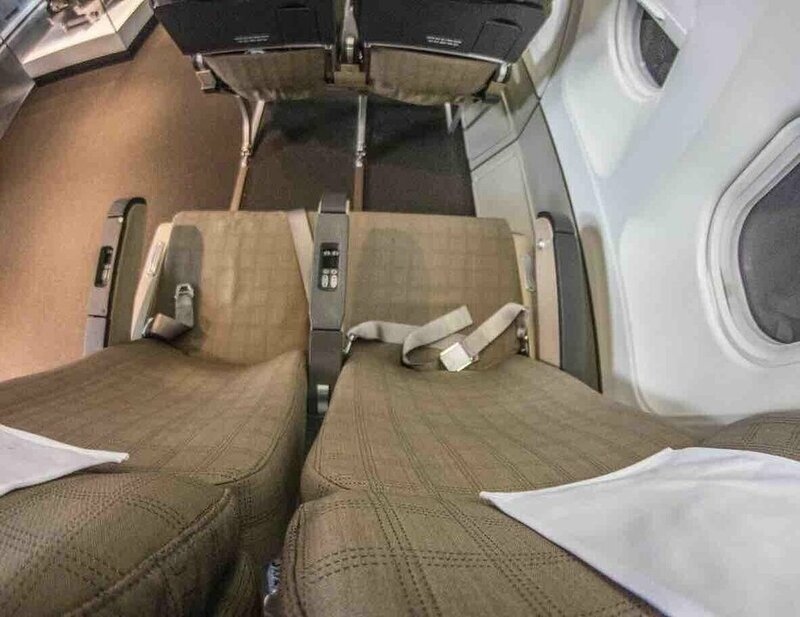 41 K None No Power Seat 41 K is an Economy Class seat that may have restricted legroom and under seat storage due to the presence of an entertainment equipment box. 42 A None No Power Seat 42 A is an Economy Class seat that may have restricted legroom due to the presence of an entertainment equipment box. 42 D None No Power Seat 42 D may have restricted legroom due to the awkward configuration transition from 4 to 3 seats. Because of the misalignment of the seats, the TV screens are not directly in front of the seat, which some find uncomfortable. 42 E None No Power Seat 42 E may have restricted legroom due to the awkward configuration transition from 4 to 3 seats. Because of the misalignment of the seats, the TV screens are not directly in front of the seat, which some find uncomfortable. 42 G None No Power Seat 42 G may have restricted legroom due to the awkward configuration transition from 4 to 3 seats. Because of the misalignment of the seats, the TV screens are not directly in front of the seat, which some find uncomfortable. 42 K None No Power Seat 42 K is an Economy Class seat that may have restricted legroom and under seat storage due to the presence of an entertainment equipment box. 43 A None No Power Seat 43 A is an Economy Class seat that may have restricted legroom due to the presence of an entertainment equipment box. 43 D None No Power Seat 43 D is an Economy Class seat that may have restricted legroom and under seat storage due to the presence of an entertainment equipment box. 43 G None No Power Seat 43 G is an Economy Class seat that may have restricted legroom and under seat storage due to the presence of an entertainment equipment box. 43 K None No Power Seat 43 K is an Economy Class seat that may have restricted legroom and under seat storage due to the presence of an entertainment equipment box. 44 A None No Power Seat 44 A may have restricted legroom due to the presence of an entertainment equipment box as well as limited recline due to the bulkhead behind. The proximity to the lavatory may be bothersome. 44 B None No Power Seat 44 B is an Economy Class seat that may have limited recline. The proximity to the lavatory may be bothersome. 44 D None No Power Seat 44 D is an Economy Class seat that may have restricted legroom and under seat storage due to the presence of an entertainment equipment box. 44 G None No Power Seat 44 G is an Economy Class seat that may have restricted legroom and under seat storage due to the presence of an entertainment equipment box. 44 J None No Power Seat 44 J is an Economy Class seat that may have limited recline. The proximity to the lavatory may be bothersome. 44 K None No Power Seat 44 K may have restricted legroom due to the presence of an entertainment equipment box as well as limited recline due to the bulkhead behind. The proximity to the lavatory may be bothersome. 45 D None No Power Seat 45 D is an Economy Class seat in the last row of the plane that may have limited recline. The proximity to the lavatory and galley may be bothersome. 45 E None No Power Seat 45 E is an Economy Class seat in the last row of the plane that may have limited recline. The proximity to the lavatory and galley may be bothersome. 45 G None No Power Seat 45 G is an Economy Class seat in the last row of the plane that may have limited recline. The proximity to the lavatory and galley may be bothersome. 8 A None No Power Seat 8 A is a standard Business Class seat which is missing a window. 8 K None No Power Seat 8 K is a standard Business Class seat which is missing a window. Audio Visual on Demand (AVOD) is available on this aircraft with an extensive selection of audio programming in multiple languages. This system is accessed via personal touch screen televisions. Swiss provides headsets free of charge onboard. The IFE system on this aircraft is MAS3000i by Matsushita. The Airbus A340-300 is Swiss International Air Lines' flagship aircraft. This configuration shows the newest configuration of the A340-300 with First Class and a staggered Business Class product. A new Economy Class is also featured on this version. All Economy Class seats A,D,G and K may have restricted under seat storage or legroom due to the presence of an entertainment equipment box. Interior of 340-300 is tired. Constant outages with entertainment system. As noted elsewhere, the entertainment box consumes half the foot space for this seat. The impact on comfort is noteworthy -- should indeed be marked yellow! The A340-300 is a very old plane. The audio/video is decrepit. These bulkhead seats have limited foot room, not like the diagram shown. The A330-300 that we were on last September (Boston-Zurich) was great. Seat 14B is jutting out from the rest of the B seats and as such sits under the air conditioning vent. 10 hours from JNB to ZRH with a blast of cold air on my right shoulder. Avoid this seat at all cost. Ignore older reviews about an entertainment box taking legroom, apparently some of the fleet has been upgraded because seats were modern and had touchscreens in the headrests. I just had a very comfortable flight from ZRH to CPT. I'm 188cm and athletically built, the seat was plenty comfy. Row 35 is just about the ideal row for night flight because you're halfway between the toilets so you don't get bothered. People in front of you go forward, people behind you go to the back. Personal entertainment screen had ample movies, series and games. I just can't understand people whining about legroom etc. Perhaps other planes are still older. Edelweis service in economy was excellent by the way. Recommended. Worse experience ever. Avoid economy if you can. 11hr flight of torture and I am fit 188cm tall person. The seat is toooooooo narrow. The entertainment box takes half of the space for your legs. It almost impossible to put 2 legs in if you are not super thin with short legs and small feet. The seats with the box should be marked at least yellow. For taller people red. All this for a 90s entertainment system with a poor display. Thanks. Your existing comments were useful. I would however like to add that seat 45G also has limited legroom due to the presence of what I think was an entertainment box. This did not apply to seats 45D and 45E. Avoid 45G with all you are worth! Your face is 30cm away from the toilet and 1 meter away from the galley. The seat reclines 6mm and to cap it all more than 50% of your legroom is taken up by a huge pre-2000 media box. Most definately the worst experience ever. Luckily, the staff were great. Equipment boxes restricting legroom are not only found under seats A, D, G and K. I was seated on 24J and got one such box under front seat 23J. Makes seating with long legs rather uncomfortable. Mediabox under seat in front! I had E42 which was very annoying to watch a film. Lucky it was a night flight and I slept most of the time. On the plus side there is way more leg rooms on 42 D,E and G.
Tall travellers, avoid. Narrow seat, both armrests immovable. Electronic box under seat in front. Monitor shifted by half a seat. Very little legroom, and when the passenger in front of you reclines the back of their seat is in your face only about 20-25 cm. Miserable experience. I am a small person, cannot even imagine how a tall, bigger passenger could handle this. Washroom is right behind the seat, smelly and frequently visited by fellow passengers. Food used to be good on this flight not any more. Old First class, but great service. The entertainment display is very small. Row 23 is marked as green, meaning "good seat". However, the dividing wall between Business class and Economy class exists, which limits how far you can stretch your legs. If you are above 170cm, you cannot stretch your legs completely. This row should be marked yellow "Be Aware - see comments"
We flew business class seats 7 D and G in the aisle in early September SFO to Zurich. Window seats were not available when we booked, too bad as once everyone shuts the shades, it is like flying inside a dim tin can. The Airbus 340-300 has two seats in the middle section, single seats on the starboard side and alternating single/double on the port side. There is no room for stowing stuff like a laptop or books during the flight, just a seat pocket filled with airline and safety info, although the bins above are cavernous. Crew was highly efficient and friendly. Food service was perfunctory and rapid, carried out by rolling carts down the aisle which was odd. Champagne was offered in glass glasses on entry; food was fine for airplane fare with a very limited wine selection. The lay flat bed was hard, not as comfortable or soft as those in Delta long hauls, although enough stretch out room for one 6' 2" tall. There was a ridge toward the lower end which one felt in one's ankles. I would fly SWISS again to Zurich from SFO again only because it is a nonstop on this route; otherwise, I would avoid it and travel on DL or UAL for better service and comfort in the business section. The entertainment box is underneath the seat 23B (in front on the left) - Restricts a bit the space for the legs on the 24B. Super first class trip. Singapore to Zurich. Unobtrusive but complete service. Nothing a problem. Bulkhead seat has plenty of room for sitting, but stretching legs is limited due to wall. Felt less cramped on second leg of flight in a normal seat. 23J was unoccupied, but due to immovable armrest could not take advantage of an empty seat next to me. Worst seat in the whole plane! this was right next to the bathroom and everyone going bumps into you the whole flight! you cannot sleep because of the noise/smell/bumping. I flew SWISS Economy from SFO-ZUR because it was nonstop. First of all, these planes are OLD (return flight too). The TV monitor control box is under the window seat, so my husband on the window had half his leg room occupied by this metal box. The TV monitor is tiny and extremely OLD. Very difficult to use. On the return, no one around me could get the monitors to work despite 3 reboots. The flight attendant said "this happens all the time because these planes are so old". Food mediocre, service was ok but for $2000 a piece, not a good experience. Air France or KLM Economy was like Business Class compared to the SWISS Economy experience. This seat and many others in business are single: there is only one where you would usually find 2. The overall look and feel is a bit dated but thhe single seat configuration is really great. Highly recxomended. Seat was lie flat, plenty long but hard and uncomfortable for sleep. OK for sitting. Unacceptable was the noise from the galley, talking and banging. Also noise fro lav. Food better than average, nice flight attendants. I booked on United web site and advance seat selection was not available. I will not fly Swiss again unless I can select seat in advance. The seat is a bit dated and especially the IFE with the small screen is definitely not up to standard anymore. The airshow doesn't show any detailed map pictures, only a world overview which does not show a precise location, especially on the small screen. Compared to the new 777 Business Class, this seat truly is a lie flat, even though the feet tunnel is a bit narrow and the arm rest is somewhat disturbing when the seat is flat. I definitely prefer this seat for sleeping over the newer version!! Food services was good, even when in details it's a bit "cheap". For a so called "premium" airlines I find it strange that you get the food on a single tray served in business. And why there's no table cloth served for breakfast, only for dinner? Only two toilets for the business class is a bit on the low side too. This is a terrible business class seat. I cant beleive that SeatGuru calls this a standard business class seat. It is signifigantly smaller than the other seats. It has no private table like many of the other seats. It juts out into the aisle by 35cm (more than 13") and there is no divider between the seat and the aisle. As a result, people and attendants are contsantly bumping into you as the pass by. This seat should certainly be marked red. Seat 2K is the best 1st class seat because it's farthest from the lav and galley, and more separate from neighbors than the D and G seats. The plane is old and seats had fewer adjustments for sitting than some newer aircraft. For example, you can't extend the footrest, so if you have long legs and raise the footrest, your feet will dangle in midair. Still, this was by far the most comfortable plane for sleeping that I've encountered and that is what matters most. The seat is a true 180 degree lie flat, not the evil 167 degree pitch that tips you underneath the row in front of you all night. Also, at bed time the flight attendants overlay the seat with a substantial featherbed which is covered in a nice white sheet and makes a huge difference in comfort. Finally, there are no armrests or cabinets to pin you in, so your shoulders have room to move about. The food and service were excellent, and the seat table folds out into a nice big size about 3 foot square, which is much more than the little trays I'm used to. THis was my first trip with Swiss Air, and I was really happy with it. Terrible..poorest quality of service..paid premium for a particular seat that was never allotted..Swiss airlines kept allotting 24K (worst seat) on their own..no concept of customer service...very small portions of food...had been a frequent traveller until now...but will never fly Swiss again.. The inflight entertainment screens are from poorest quality, scratched and the headphone jacks are wasted. Also the system needed multiple reboots in the beginning. Service was ok.
4K is a solo window seat in the front of the first business section of only two rows. Very happy with it. The Swiss long-haul business seats are, in my view, the best for sleeping, and I wonder if some of the negative comments are for a different plane or configuration. The bed has a solid feel, and is wide, with plenty of room for legs and to turn on your side. I'm 193cm tall and weigh 100kg, and after one trip to Singapore on Swiss, I specifically purchased the SFO to Zurich flight for the comfort factor, as this is the only seat I seem to be able to sleep in. Far more comfortable and spacious than even the new Lufthansa seats. Crew was nice and dinner was good. (A rare inflight meal of fish that was not overcooked.) Arrived rested and pleased with the flight. There is a metallic box under the front seat. Not enough space for legs. The seat is narrow maybe because the TV monitor is stored in the armrest. On the positve side there is decent legroom and there is no seat in front reclining back into your face!. I am nearly 2 metres tall. There is a big problem in all the seats in the window side. The media box is located bollow the seat in front of you, limiting the free space for your legs. Very bad! Be aware and avoid those seats. 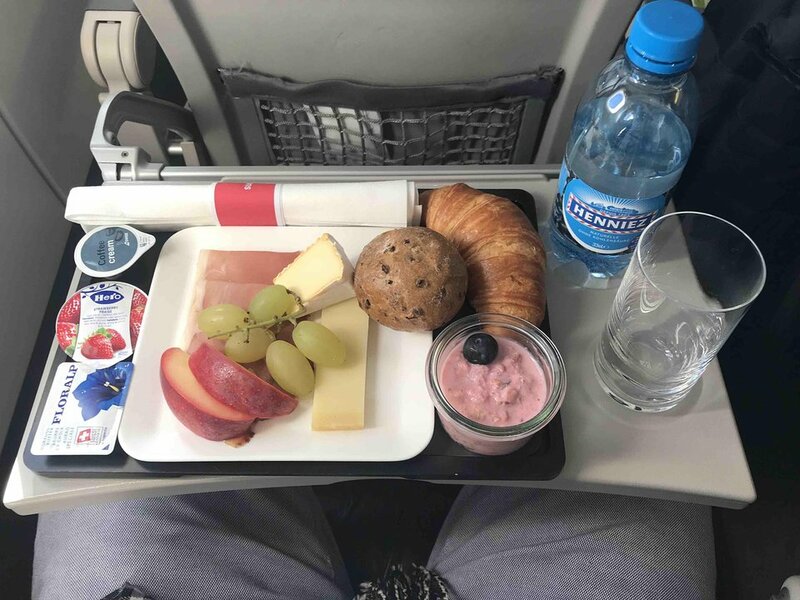 I have been traveling business class for a few times now and Swiss Airline flight from BKK to Zurich is one of the poorest in terms of quality and comfort. POSITIVES: seats are comfortable and flat bed. The food was good. NEGATIVES: it feels like it is an old aircraft with the old technology in place. There is no usb plugs, no high definition touch screen, still using tethered remote control. when lying flat you can't see the pictures on screen because of the angle. The food is average as well as service. I requested an extra pillow, I have been given one from economy. Lack of little storage compartments. Seat 24K has a large IFE equipment box in the footwell, leaving only very limited space for your feet. There is a bit of extra space between the bulkhead and seat where you can put smaller items, like a pillow or jacket. The outboard armrest folds, but only to 90 degrees, so its prevents you from leaning on the bulkhead with it folded up. I paid for extra leg room and chose seat 23E. It is in front of a wall, I could not stretch my legs and was very uncomfortable. You get better off sitting behind a seat where you can stretch your legs under the seat. The same applies for 23F. It felt nothing like a 32" pitch - I wonder if they are indeed 32" pitched..... I am 184 cm tall and I insisted on flying with Swiss since they are the only regular carrier to fly widebody airplanes with 32" pitched seats Between Tel Aviv and Europe. Entertainment box was indeed bothersome but not to a level I could not stand it. All in All I was disappointed with the size of the seat. SWISS has installed superb First and Busineess Class Seats. But absolutely no product upgrade in Economy for years. The entertaiment boxes are really a problem. The entertaiment system monitors are poor quality. Hopefully they will do better on the B777 coming to service soon. Until then avoid this aircraft. This seat should be avoided if you are a single traveler. If the passenger in seat 14B has their seat in the fully-reclined position and you need to get up in the middle of the flight you will have to step over him/her. There's no easy (or graceful) way to do this! Seat is good for those like to get frequently on long haul flights, but the seat electronics box in this seat takes almost half of the foot space. Maybe change this to a MIXED REVIEW to ensure it's noted. The seats on this airplane are really narrow. I'm not big and could just get into the seat. Also the media system on the floor makes it hard to find decent room for the feet under the seat in front. There's more room in the middle seat if you want to stretch out your legs. Best Economy Seat ever. 23D is in the first row, in front only curtain, no wall because the wall starts in front of 23E. People with Long legs will like it. food and staff also very good. AVOID! If you are taller than 5 foot 8 inches do not sit in couch! No leg room due to entertainment system and tight rows. Person in front reclined and I could not move without bumping their seat and then could not see the movie screen on the seat back. Worst flight ever as I am over six feet tall, never again! 45D and Seat 45G are the WORST seats in the plane!! You sit RIGHT BESIDE the Lavatory, Every time someone flushes the toilet you hear it, all the people hang around the seat waiting to go inside, so the door is always opening and closing adding to more noise. Plus it in the very back so you are cold due to the back door, also everyone headed to the toilet watches what you are doing. If you get this seat Poor you!! I found both window and aisle seats in this aircraft very uncomfortable. I am 173cm and my legs nearly touched the next seat. The width of the seat was appalling - I'm not a slim lady and was literally wedged in, but my friend who flew with me is smaller than me and very slim, and she struggled too. When the seat in front is leaning back there is no way to bend down and reach the bag on the floor. Both journeys ZRH-SFO and back (about 12 hours) felt incredibly cramped. In addition, the service was bad, we were left without food or drinks for several hours and ended up having to go to the back of the plane to help ourselves to water. Not flying this far with Swiss in Economy ever again. Economy seats have a narrow pitch, meaning that when the person in front of you recline the seatback. you can barely move your legs. The entertainment boxes under the seats A-D-G-K makes it almost impossible to stretch more than one leg at the time under the seat in front of you. Dated seat configuration and in-flight entertainment. No aisle access wgich meant when aisle passebger was sleeping, I had to waken him which was bithersome. Service was polite and discreet with no cabin crew hovering. Flew LAX-ZRH. I agree that there was limited storage at the seat, but my wife and I each had aisle access which was nice overnight. Service by the crew was very good. Nice choice having an audio book instead of TV shows or movies. We were pleasantly surprised by the cabin layout, decoration and comfort of the seats. Fully flat when totally reclined. Food and choice of drinks were excellent. Cabin crew good. Flew SFO-ZRH. So uncomfortable. Large "entertainment box" under the seat in front, no place to put my feet. I really echo what others have said -- when the seat in front reclined, I was essentially trapped; ancient barely-visible video screens; mediocre food; just a ridiculously uncomfortable flight. Never again. 44A, B, J, K are terrible. The yellow marking does not reflect how bad they are, should be red. The description only mentions the entertainment box in A/K and the proximity to the lavatory. The real issue is, however, that the seat does not fully recline. This is not only uncomfortable for long flights, but due to the fact that the IFE is terrible, you cannot see anything if the person in front reclines. The viewing angle of the screen is so narrow, it's unwatcheable. So on long flights, it's hard to sleep AND you can't watch movies. Food, service and temperature were OK (LX93). Good cheese and chocolate, bread was dry. 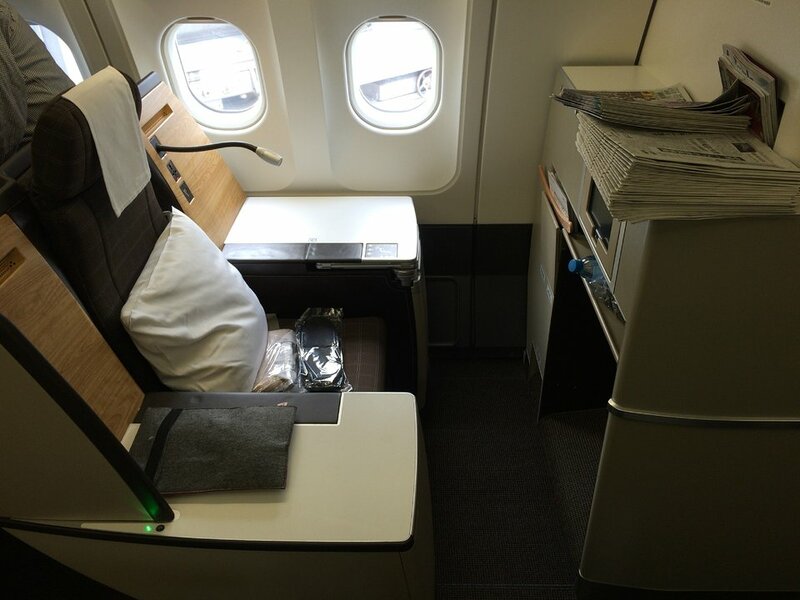 Seats 6A, 8A, 10A and 12A are the best business class seats on the plane. These are solo seats, with wide shelves on both sides of the seat. These should probably be marked in green as preferred business class seats. Normally windows seats offer the possibility to lean against. But not in SWISS. There is about a handspan space between a relative low armrest so you should bend quite much, but there is the armrest which holds you back painfully. In my two flights ZHR-GRU and back, the mentioned box under the seats which takes half of the space was below window seats and not below aisle-seats. But on aisle seats economy you should take your sleeping bag into cabin. The Aircon is above the overheadcompartments and it was freezing cold, the thin tiny cover doesn't work. For a Swiss it is very sad to see that a former premium airline becomes mediocre or less. Seats K in economy have narrow legroom due to the media box. Could not fit my laptop backpack under the seat. The media center was not operated via touchscreen but via controller. Some seats (including 38J on my flight) had issues with the audio jack which did not provide sound to both sides of the headphones. Service was very good and otherwise seats were relatively comfortable. I had a flight from Zurich to Cairo couple of years ago. It was an excellent flight and excellent seat. But i have no idea how tired could be the cabin now. this is such a nice flight! 4K is one of the best seats in my opinion in the mini-cabine... food is GREAT and the service is always awesome! flight attendants really pay attention and are very friendly. OK the only thing i have to say the IFE is not that good... small screen, not that many new releases, if you switch movies halfway, you can't come back to them and play from where you left off.. the fast forward button forwards, well, too fast.. and it easily freezes the whole system and they have to restart it (takes 10 minutes). also, the seat massage feature lasts only like 5 minutes.. if i'm on a 12 hour flight and want to get a seat massage, i don't want to push the button every 5 minutes... anyways besides that, this is a very good flight that i highly recommend. row 23 is a bulkhead row. Although the seats there have a little bit of extra legroom, the whole row is too close to the separation wall btw business and economy - making it impossible to stretch your legs. Flew Los Angeles to Zurich in economy on a United code-share. SWISS does not allow code-share passengers to reserve a seat unless is is less than 24 hours to departure time. Poor way to encourage people to come back. As noted by others, the aisle seats have large electronic boxes under them so you can't have your briefcase nearby during take-offs and landings. Ancient LCD screen for video has a very small viewing angle and if the person in the seat in front of you reclines his/her seat, the screen is virtuall unviewable. Beef dinner had 3 tiny pieces of beef in it. Slept okay though the seat is by no means comfortable. Will try to avoid SWISS in the future. Leg room is ok,you always wish for more but this is economy,trouble is that the seat cushion is very very hard and under the seat in front is the ife box,this takes up half of your 'feet space' making it feel cramped!! The seat back screen is very poor and becomes totally unwatchable if the seat in front is reclined. On the plus side,food and drink was very good. Swiss international airlines long haul isn't the worse airline ive been on but it could be much better,just needs to change the seating. 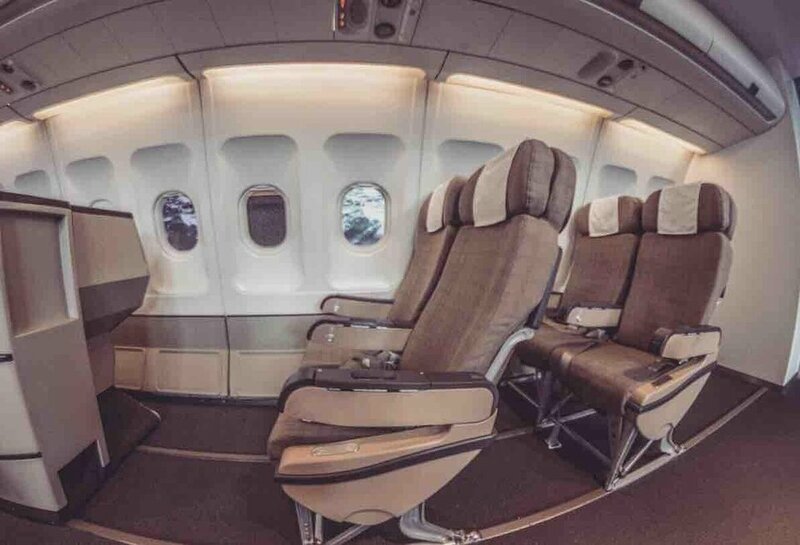 According to the steward 10A is the best on the aircraft, with the single seat arrangement it does have a lot of space, and some additional privacy since there is the mini bulkhead arrangement for the passengers behind. 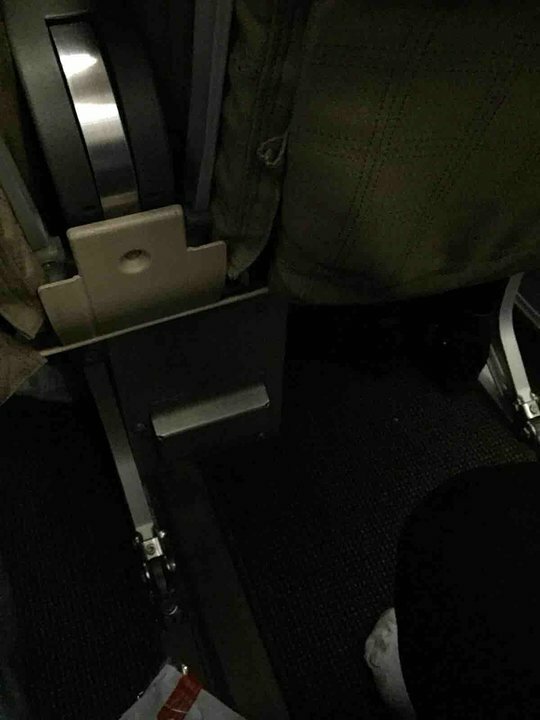 Seat cushion is very hard,ife box under seat in front means your legs are always at an angle,video screen is very poor and cant be watched at all if the person in front reclines their seat back. This was the worst business class experience my wife and I have encountered. The plane itself is ancient with an entertainment system from the early 90s that crashed twice. Seats 5A & 5B have no room to store anything you might need during the flight. Why did Swiss chose to shoehorn in an additional seat? These two seats are also right in front of the galley which on our flight was quite noisy. The crew was young and inexperienced too. Probably the normal attendants chose to have Christmas week off. Finally, the food was awful. McDonald's would have been much better. ZRH to SFO. First class lounge is nice, but overcrowded. Suttled to flight in a VW van with 4 strangers touching knees. Would rather have walked myself. Very disappointing "old style" first class seats, which are in bad need of replacement. The service and food were outstanding. The bedding was some of the best I'd experienced. One tiny, filthy bathroom for the cabin, often used by biz passengers as well. Absolutely awful seat. There's a metal box (probably with entertainment system for the seat in front) that is taking up half the space below the seat in front. I could only fit one leg below the seat in front, the other had to be in the aisle, where it was constantly hit by people passing by, carts etc. Avoid! The most uncomfortable flight I've been on. Cramped seat even before passenger in front reclines. Being quite tall coupled with the seat in front reclining means the screen in the seat back is completely black and unwatchable. Food ok but found the cabin crew quite abrupt, especially when waking up the cabin for breakfast. The entertainment electronic box takes up fully half of the leg room width - so don't plan on putting a bag on the floor. And yes, as mentioned, this seat was cold. Seats 39 D and G as well as 40 D and G are extremely cold due to two AC vents blowing on these seats. We had to have a second blanket to keep us warm. ORD-ZRH. Spotless cabin, with really efficient service, good IFE selection, very edible food and quite good wine in economy. The seat itself was comfortable enough but the legroom was awful for an 8hr flight; when every the woman in front of me tried to recline her seat went hard into my knees (repeatedly). They claim a 32" pitch, but in the forward econ cabin it seems tighter than that, anyone over 6 ft is going to need exit row for sure. Excellent seat, extends to flat bed, comfortable in every seating position. Located in very quiet section of cabin right behind First Class section. Very friendly and professional service. Delicious meals, entertainment program very good. Would prefer Swiss to most if not all other airlines if available for my travel routes. This is a small area of business class seats - really quiet and comfortable. Great airline!